Mental health patients boarding for long hours, even days, in United States emergency departments (EDs) awaiting transfer for psychiatric services has become a considerable and widespread problem. Past studies have shown average boarding times ranging from 6.8 hours to 34 hours. Most proposed solutions to this issue have focused solely on increasing available inpatient psychiatric hospital beds, rather than considering alternative emergency care designs that could provide prompt access to treatment and might reduce the need for many hospitalizations. One suggested option has been the “regional dedicated emergency psychiatric facility,” which serves to evaluate and treat all mental health patients for a given area, and can accept direct transfers from other EDs. This study sought to assess the effects of a regional dedicated emergency psychiatric facility design known at the “Alameda Model” on boarding times and hospitalization rates for psychiatric patients in area EDs. Over a 30-day period beginning in January 2013, 5 community hospitals in Alameda County, California, tracked all ED patients on involuntary mental health holds to determine boarding time, defined as the difference between when they were deemed stable for psychiatric disposition and the time they were discharged from the ED for transfer to the regional psychiatric emergency service. Patients were also followed to determine the percentage admitted to inpatient psychiatric units after evaluation and treatment in the psychiatric emergency service. In a total sample of 144 patients, the average boarding time was approximately 1 hour and 48 minutes. Only 24.8% were admitted for inpatient psychiatric hospitalization from the psychiatric emergency service. 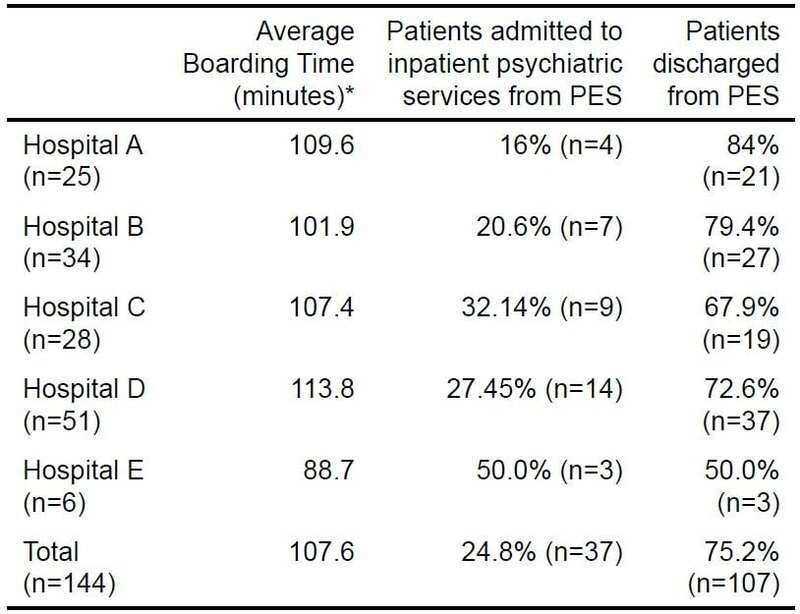 The results of this study indicate that the Alameda Model of transferring patients from general hospital EDs to a regional psychiatric emergency service reduced the length of boarding times for patients awaiting psychiatric care by over 80% versus comparable state ED averages. Additionally, the psychiatric emergency service can provide assessment and treatment that may stabilize over 75% of the crisis mental health population at this level of care, thus dramatically alleviating the demand for inpatient psychiatric beds. The improved, timely access to care, along with the savings from reduced boarding times and hospitalization costs, may well justify the costs of a regional psychiatric emergency service in appropriate systems. Table 1. 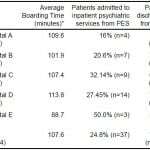 Studies of boarding times for psychiatric patients in theemergency department (ED). *Time from decision to admit until discharge from ED. 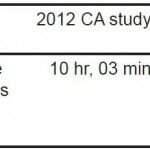 A more recent study, published in 2012, reported that in a survey of ED directors in California the average wait time for adult patients with a primary psychiatric diagnosis in the ED, from the decision to admit until placement into an inpatient psychiatric bed or transfer to an appropriate level of care, was 10.05 hours.9 As these data could be considered to be of similar parameters, including being under the same state laws and regulations as the metrics in our proposed study, these results were chosen for comparison to our outcomes. A dedicated psychiatric emergency services (PES) unit is a stand-alone ED specifically for psychiatric patients. Although many are independent or on a separate campus, most PES units in the U.S. are affiliated with an adjacent medical ED.20 Rather than merely triaging and transferring psychiatric patients as is common in a standard ED, in a PES unit, patients are evaluated, receive intensive treatment, and are allowed time for observation and healing (typically, up to 24 hours is permitted onsite in these programs, which are considered to be outpatient services).21 A common goal of PES programs is stabilization of acute symptoms and avoidance of psychiatric hospitalization when possible; the added time for onsite treatment and observation (which has led such operations to be known as “23-hour facilities”) is what typically makes these results feasible. Alameda County, California, with a population of approximately 1.5 million, covers over 800 square miles in the East Bay region of the San Francisco Bay Area.25 It includes such cities as Berkeley, Oakland, Pleasanton and Fremont. To provide emergency psychiatric care for this wide area with dense population centers, the county evolved what will herein be described as the Alameda Model. California Welfare and Institutions Code sections 5150–5152 grant authority to police and other designated personnel to detain, transport, and involuntarily hold for up to 72 hours an individual deemed to be, due to a psychiatric condition, either a danger to self, a danger to others, or “gravely disabled” (wherein a mental condition makes one unable to provide for their own food, clothing and/or shelter).26 In Alameda County, when law enforcement officers initiate an involuntary psychiatric detention (known in California as a “5150”) on an adult, rather than transport the patient themselves for evaluation (as is common in other locations) they call for an ambulance instead. The arriving ambulance crew does a field screening, then determines if the patient is medically stable; if yes, they will transport directly to the PES at the stand-alone John George Psychiatric Hospital (approximately 60% of cases). If considered medically unstable, the patient is taken to the closest of 11 medical EDs in the county for evaluation and medical clearance. Once such a patient taken for medical clearance is deemed stable for psychiatry, the attending physician at the medical ED contacts the psychiatrist at the John George PES for immediate transfer, rather than needing to seek an onsite consult. As this is considered a transfer from an ED to a dedicated emergency department for a higher level of care (comparable to transferring from a general ED to a trauma center), transfers are accepted regardless of inpatient bed availability. 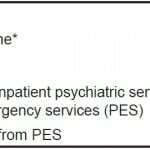 This means that once the referring ED has medically cleared a patient with an acute psychiatric condition, the John George PES will accept the patient for psychiatric evaluation without delay, whether or not the John George hospital has a bed, and irrespective of the patient’s reasons for involuntary detention or previous psychiatric history. (There are no exclusions for specific individuals, no “no-admit” list, and no declining based upon an individual being “too violent” or “sociopathic.”) Further, patients are accepted whether or not they have health insurance, and without any distinctions based on insurance carrier. The Alameda Model thus provides for a 24-hour-a-day crisis mental health service that can be accessed either via ambulance from the field, or by direct transfer from any county ED. (Patients may also self-present for care.) As a result, areas EDs have a constant disposition for acute, involuntary psychiatric patients, and do not have to devote resources to providing immediate onsite psychiatric consultation or trying to obtain a psychiatric hospital bed. Once at the PES, patients receive intensive treatment with psychiatrists, nurses, and other affiliated personnel for up to 24 hours onsite, with the goals of rapid stabilization of the acute mental health crisis, and avoiding inpatient hospitalization when possible and appropriate. This design suggests it should logically reduce psychiatric patient boarding times while also decreasing the percentage of patients admitted for inpatient care; yet the extent of such improvements had previously not been quantified. In this paper, we describe the results of a study of boarding times and psychiatric hospitalization rates in 5 hospital EDs operating under the Alameda Model for managing psychiatric emergencies. Of the 11 hospital EDs in Alameda County, we selected 5 for this study because they were all general community hospitals with no other urgent psychiatric options but to transfer to the John George PES. This makes the sample a fair comparison to the EDs in the 2012 California survey,9 where there would also be little alternative to transferring out for psychiatric care. The medical directors of each ED agreed to participate in data collection, but they were not told the nature or design of the study. Similarly, no staff members at the John George Hospital PES were informed that a study was underway. Each of the EDs tracked the time when each patient in their facility on an involuntary 5150 mental health hold was deemed stable for psychiatric disposition, measured as the first minute the attending physician would attempt to telephone the John George PES for transfer. The second data point was the moment the patient exited the ED for transfer to the John George PES. Data were collected for all patients during the 30-day period from 10 am January 15, 2013, to 10 am February 14, 2013. We determined the boarding time for each patient by finding the difference in time between discharge from the ED and time the initial call was made to PES to request a transfer. We then calculated the average boarding time for all patients. Each patient was tracked in PES to determine whether they were discharged or admitted to inpatient psychiatric services. We calculated the percentage of admissions by dividing the number of patients admitted by the number of patients tracked. After completion of the 30-day study, a retroactive chart review was performed at John George Psychiatric Hospital for each patient identified, solely to determine if the patient was admitted for inpatient care after evaluation and treatment in the PES or was discharged. Patients were only identified to the extent that aggregate data could be collected, and the study did not influence the care of any patient involved. The institutional review board governing the John George Hospital approved the study as exempt from review. A total of 150 patients were tracked over the data collection period. Data from 6 patients were incomplete and, therefore, discarded, resulting in a sample of 144 patients (Table 2). Table 2. 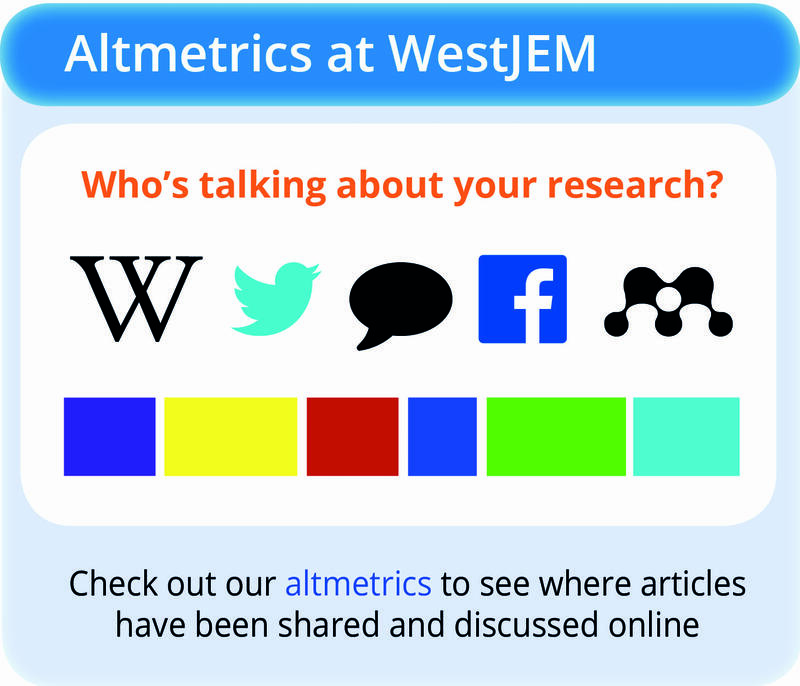 Boarding time and psychiatric hospitalization rates under the Alameda Model. *Time from patient determined to be stable for transfer to discharge from the emergency department. The average length of boarding time for psychiatric patients was 107.56 minutes, or approximately 1 hour and 48 minutes. Of the 144 patients tracked, 24.8% were admitted to inpatient psychiatric services from PES while 75.2% were discharged from PES. Table 3 shows the average boarding times and admission rates for each of the 5 hospitals in this study. Table 3. Boarding times and disposition, by hospital. *Time from patient determined stable for transfer to discharge from the emergency department. To date, most proposed solutions on this issue have emphasized a call for more psychiatric inpatient beds or better access to existing beds. Very little attention has been given to alternative treatment designs, specialized outpatient emergency psychiatric care, or methods to reduce the demand for inpatient beds. However, since reducing hospital inpatient admissions and re-admissions is a goal of present healthcare reform efforts,29 it would follow that the most rational approach to this problem would be to provide prompt access to crisis services that can help avoid inpatient care altogether. Unfortunately, too often the only options for mental health patients in EDs are either inpatient psychiatric admission or discharge home. For those under involuntary psychiatric detention, it can be assumed that in some jurisdictions, pending available beds, hospitalization rates for these individuals approach 100% — because there is often no other possible destination. This appears to be an unnecessary, time-consuming and expensive outcome, roughly equivalent in nature to hospitalizing every patient who went to an ED with chest pain. The Alameda Model appears to be a potential alternative for systems in which the volume of patients with emergency psychiatric conditions far exceeds available psychiatric inpatient beds. By providing patient care in a PES both directly from the field and by self-presentation, the model avoids medical EDs altogether for most medically stable patients in a psychiatric crisis. For patients requiring medical stabilization, the PES permits swift transfer from medical facilities lacking appropriate mental health treatment options to an emergency care facility designed solely for psychiatric care. In a dedicated PES operating with a goal of avoiding hospitalization when possible, unnecessary inpatient admissions are avoided, and inpatient psychiatric beds are reserved for those who truly need them. 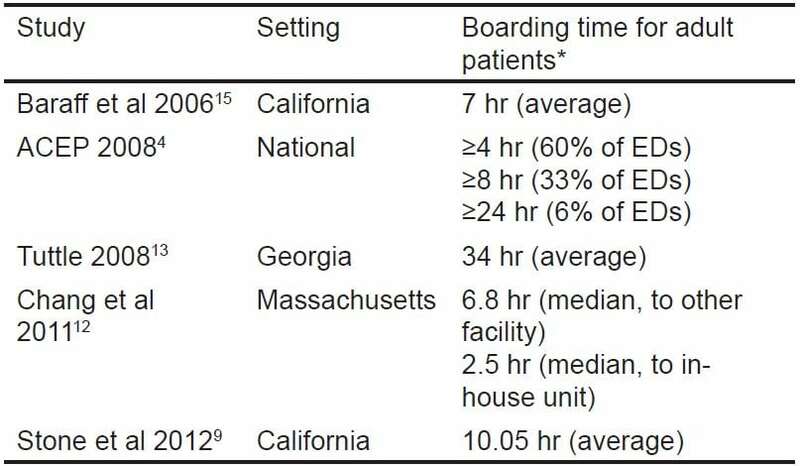 Compared with the most analogous published data, a study of boarding times in California EDs9 (published in 2012 with one of this study’s authors as lead author) that found an average boarding time of over 10 hours, the EDs in the Alameda Model boarded psychiatric patients for only 1 hour and 48 minutes—a difference of over 80% (Table 4). Based on the assumption that many systems transfer nearly all of their involuntarily detained psychiatric patients to inpatient psychiatric hospitals, application of the Alameda Model may reduce psychiatric inpatient hospitalization by as much as 75%. Table 4. 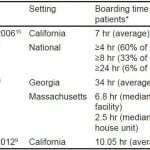 Comparison of average boarding times, Alameda model versus 2012 California (CA) study. The relatively high rates of discharge and low rates of hospitalization under the Alameda Model can be largely attributed to the delivery of intensive treatment onsite, while these patients might have been provided with little or no treatment during the time spent boarding in other systems. The average patient at the John George PES spends between 16 and 22 hours in treatment; the discharges from the PES are, for the most part, not because the patient did not need acute crisis stabilization but rather that most psychiatric crises can be stabilized in less than 24 hours with appropriate interventions, obviating the need for inpatient hospitalization. Interestingly, opportunities to develop the Alameda Model elsewhere in the U.S. may not need special funding or expensive new initiatives. The authors posit that the Alameda Model is currently possible across California (and indeed there are numerous analogous PES programs in California), because California Medicaid (Medi-Cal) has a unique facility-based billing code for “Crisis Stabilization.” With this code an hourly rate is paid to a facility, with a minimum of 2 hours and a maximum of 20 hours. No additional professional fees are permitted; rather, the PES-type facility must pay for all staff, operations, medications and laboratory studies from this reimbursement. However, the rates (typically between $97–$140 per patient per hour)30 are sufficient, with a high enough census, to pay for all services and professionals, including physicians, nursing, security, and social services/case management. Indeed, there are a number of private organizations that have created psychiatric emergency or crisis stabilization units in the U.S., but a major difficulty in further expansion has been in finding means to support such operations financially.32,33 Instituting a national billing code for crisis stabilization might facilitate development of more programs such as the Alameda Model, which the results of this study demonstrated can reduce system delays and improve access to acute psychiatric care. 1. Hazlett SB, McCarthy ML, Londner MS, et al. Epidemiology of adult psychiatric visits to US emergency departments. Acad Emerg Med. 2008;11(2):193-195. 2. Larkin GL, Claassen CA, Emond JA, et al. Trends in U.S. Emergency Department Visits for Mental Health Conditions, 1992 to 2001. Psychiatr Serv. 2005;56(6):671-677. 3. Owens P, Mutter R, Stocks C. Statistical Brief #92: Mental health and substance abuse-related emergency department visits among adults. 2007. 4. American College of Emergency Physicians. ACEP Psychiatric and Substance Abuse Survey. Irving, TX: American College of Emergency Physicians; 2008. 5. Khazan O. A long wait for mental health care. Washington Post. January 23, 2013;Metro. 6. Gorman A. ERs are becoming costly destinations for mentally disturbed patients. Los Angeles Times. September 5, 2011. 7. Layton MJ. Mental health logjam; Ill-equipped ERs fill void. The Record (Bergen County, NJ). August 18, 2009;News. 8. Slade E, Dixon L, Semmel S. Trends in the duration of emergency department visits, 2001–2006. Psychiatric Services. 2010;61(9):878-884. 9. Stone A, Rogers D, Kruckenberg S, et al. 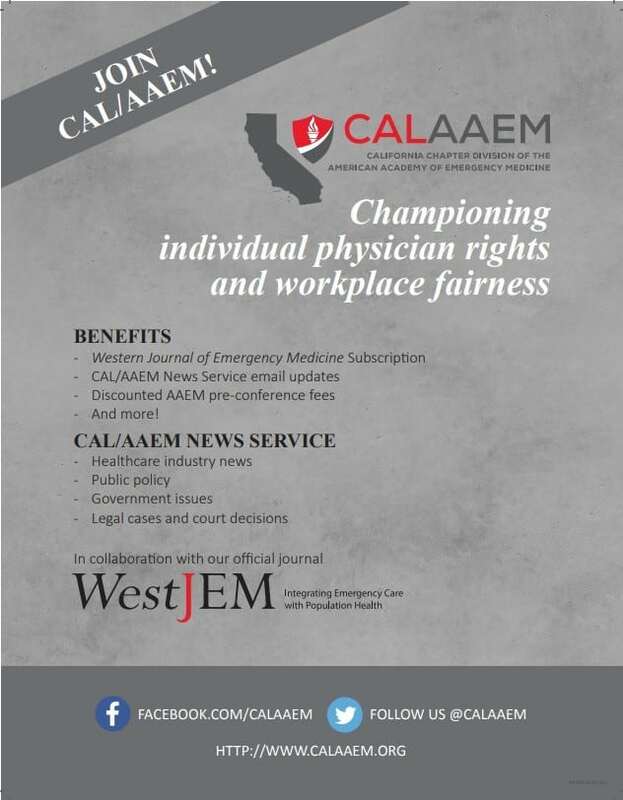 Impact of the Mental Health Care Delivery System on California Emergency Departments. West J Emerg Med. 2012;13(1):51-56. 10. Nicks B, Manthey D. The Impact of Psychiatric Patient Boarding in Emergency Departments. Emerg Med Int. 2012. 11. Fee C, Burstin H, Maselli JH, et al. Association of emergency department length of stay with safety-net status. JAMA. 2012;307(5):476-482. 12. Weiss AP, Chang G, Rauch SL, et al. Patient and practice-related determinants of emergency department length of stay for patients with psychiatric illness. Ann Emerg Med. 2012;60(2):162-171.e165. 13. 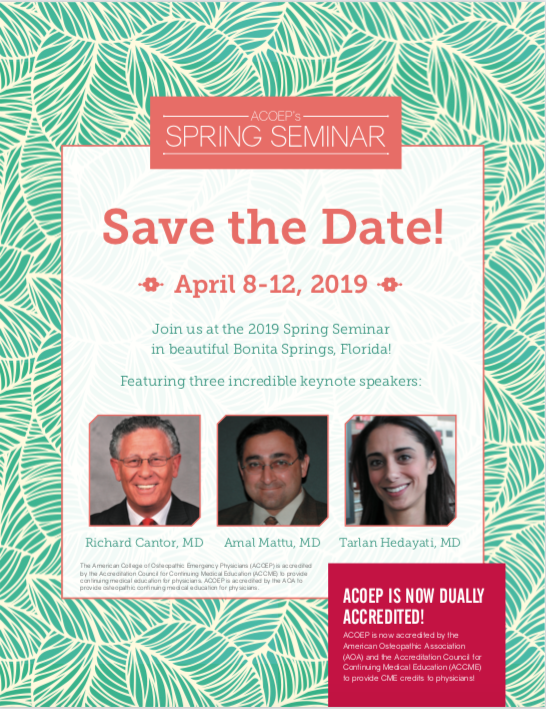 Tuttle GA. Access to psychiatric beds and impact on emergency medicine. Chicago, IL: Council on Medical Service, American Medical Association;2008. 14. Chang G, Weiss AP, Orav EJ, et al. Hospital variability in emergency department length of stay for adult patients receiving psychiatric consultation: a prospective study. Ann Emerg Med. 2011;58(2):127-136.e121. 15. Baraff LJ, Janowicz N, Asarnow JR. Survey of California Emergency Departments About Practices for Management of Suicidal Patients and Resources Available for Their Care. Ann Emerg Med. 2006;48(4):452. 16. Chang G, Weiss AP, Orav EJ, et al. Bottlenecks in the Emergency Department: the psychiatric clinicians’ perspective. Gen Hosp Psychiatry. 2012;34(4):403-409. 17. Chang G, Weiss A, Kosowsky JM, et al. Characteristics of Adult Psychiatric Patients With Stays of 24 Hours or More in the Emergency Department. Psychiatr Serv. 2012;63(3):283-286. 18. Korn C, Currier G, Henderson S. “Medical clearance” of psychiatric patients without medical complaints in the Emergency Department. J Emerg Med. 2000;18(2):173-176. 19. Allen M, Carpenter D, Sheets J, et al. What do consumers say they want and need during a psychiatric emergency?. J Psychiatr Pract. 2003;9(1):39-58. 20. Zeller SL. Treatment of psychiatric patients in emergency settings. Primary Psychiatry. 2010;17(6):35-41. 21. Allen MH. Definitive treatment in the psychiatric emergency service. Psychiatric Quarterly. 1996;67(4):247-262. 22. Alakeson V, Pande N, Ludwig M. A plan to reduce emergency room ‘boarding’ of psychiatric patients. Health Affairs. 2010;29(9):1637-1642. 23. Woo BKP, Chan VT, Ghobrial N, et al. Comparison of two models for delivery of services in psychiatric emergencies. Gen Hosp Psychiatry. 2007;29(6):489-491. 24. Gillig P, Hillard J, Bell J, et al. The psychiatric emergency service holding area: effect on utilization of inpatient resources. Am J Psychiatry. 1989;146(3):369. 25. Alameda County. Demographics: Quick Facts. 2010; Avaiable at: www.acgov.org/demographics.htm. Accessed March 24, 2013. 26. 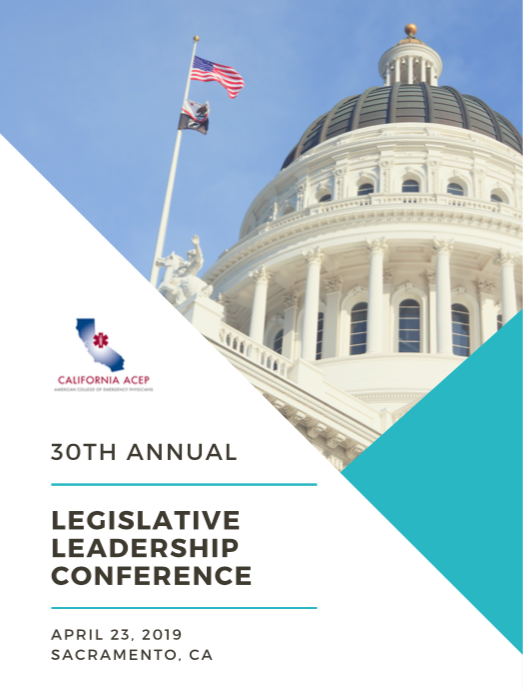 State of California Legislative Counsel. Welfare & Institutions Code 5000-5157. 1967. Avaiable at: http://leginfo.ca.gov/cgi-bin/displaycode?section=wic&group=04001-05000&file=5000-5120. 27. Wolfe J. CMS Considers Reimbursing Care at Private Psychiatric Hospitals. Psychiatric News. 2012;47(10):9b. 28. 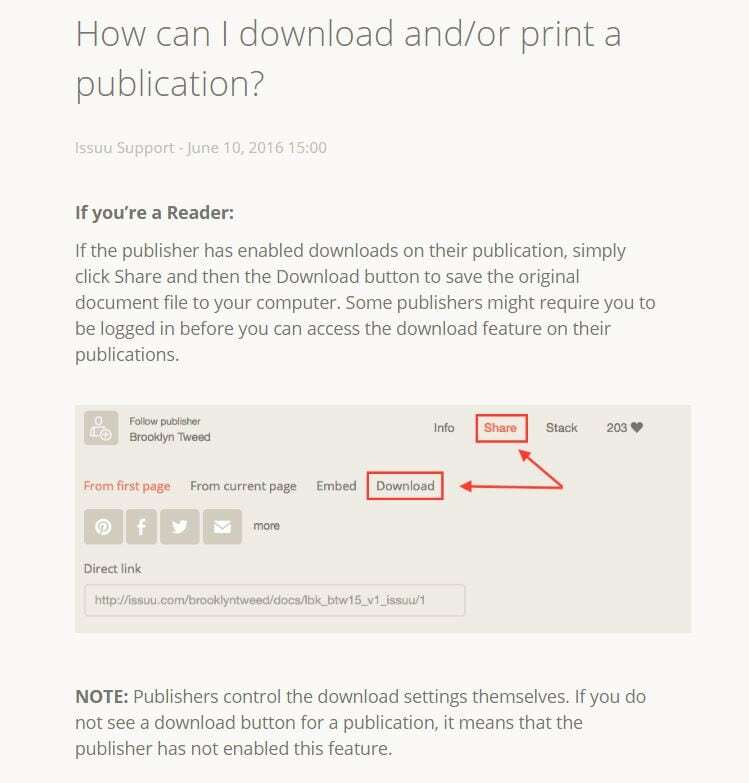 Joint Commission Resources. Approved: Standards Revisions Addressing Patient Flow Through the Emergency Department. Joint Commission Perspectives. 2012;32(7):1-5. 29. Jweinat JJ. Hospital readmissions under the spotlight. J Healthc Manag. 2010;55(4):252. 30. California Department of Health Care Services. County Interim Rate Table for Short-Doyle Medi-Cal Reimbursement County Interim Rate Table for Short-Doyle Medi-Cal Reimbursement. July 1, 2012 through June 30, 2013. Avaiable at: http://www.dhcs.ca.gov/services/MH/Documents/MedCCC/Library/County%20Interim%20Rates_Ratetable_FY12_13_07_11_12._ForPosting.pdf. 31. Doherty RB. The certitudes and uncertainties of health care reform. Ann Intern Med. 2010;152(10):679-682. 32. Wolff A. Development of a psychiatric crisis stabilization unit. J Emerg Nurs. 2008;34(5):458-459. 33. Eppling J. First Encounters: A Psychiatric Emergency Program. J Emerg Nurs. 2008;34(3):211-217.